Before the Europeans arrived in North America, the American Bison (also affectionately, but inaccurately, known as buffalo), the largest land mammal weighing as much as 2,000 pounds, numbered in the millions. 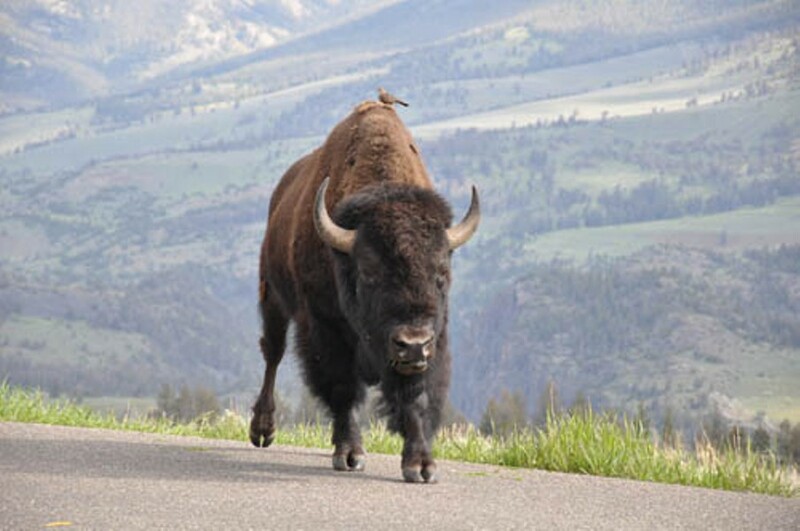 In fact, some estimate the total number of bison between 30 to 60 million. Yet by the time President Teddy Roosevelt founded the American Bison Society in 1906, there were only about 30 bison left in the wild. Ironically, what is saving the bison population is consuming their meat. The largest bison rancher in the U.S. is media mogul Ted Turner, who also owns Ted's Montana Grill, specializing in bison meat (this chain has restaurants in Durham and Raleigh). Bison meat has been increasingly popular in western states for decades. According to the USDA, 1 million pounds of bison is consumed each month by American consumers. In 2007, the USDA's most recent Census of Agriculture reported the U.S. bison population at approximately 220,000, although some bison associations claim the number is double this. Each year, about 20,000 are slaughtered for meat (in contrast to the 125,000 cattle slaughtered for meat each day). The largest bison herd in North Carolina — and the Southeast, for that matter — can be found at Carolina Bison near Asheville. This 500-head ranch was started as a hobby in the 1980s by Dr. Frank King, a researcher, lecturer and author in homeopathy. Today, his son Frank King III, a retired Marine, is in charge of operations. Why eat bison? For starters, bison meat is lower in fat, calories and cholesterol than pork, beef or chicken, according to the North American Bison Cooperative. But the better reason is taste. Bison meat has a sweeter, gamier flavor than beef — even grass-fed beef. The health benefits are what keep the King family in the bison business. Frankie King says, "People notice when you eat a big beef steak, you have that bloated discomfort feeling. You don't get that with bison." Prices for bison are comparable to grass-fed, locally grown beef. Carolina Bison sells directly to the public via a website, at farmers markets in the Asheville area, and at Earth Fare stores. Soon, Carolina Bison will be carried by a large restaurant supply company. The bison raised at Carolina Bison graze on pasture grass, drink spring water, and have never been given hormones or antibiotics. All Carolina Bison meat is USDA-inspected. Since bison meat falls under "voluntary" inspection by the USDA, Carolina Bison pays the hourly rate for those inspectors. Through August, Earth Fare has Carolina Bison porterhouse on special at $16.99/lb. The ground meat is $7.99/lb. Other cuts such as short ribs, rib roast, sirloin, rib eye and tenderloin are available through the Carolina Bison website. Heart, liver, Rocky Mountain Oysters and other offal are available, too. When cooking bison, it is important to note that this meat cooks faster than beef since it has less fat. Additionally, bison is reported to have 30 percent less shrinkage than beef, so what you see in the package is what you'll have on the plate. Bison fits into two trends in Charlotte. With burgers becoming a mainstay on menus, bison burgers are showing up with more frequency. Additionally, since bison historically grazed in North Carolina, they are "local." With their inherent disease resistance and ability to thrive in adverse conditions and diverse landscapes, tasty bison meat may, in fact, be the paramount local food.